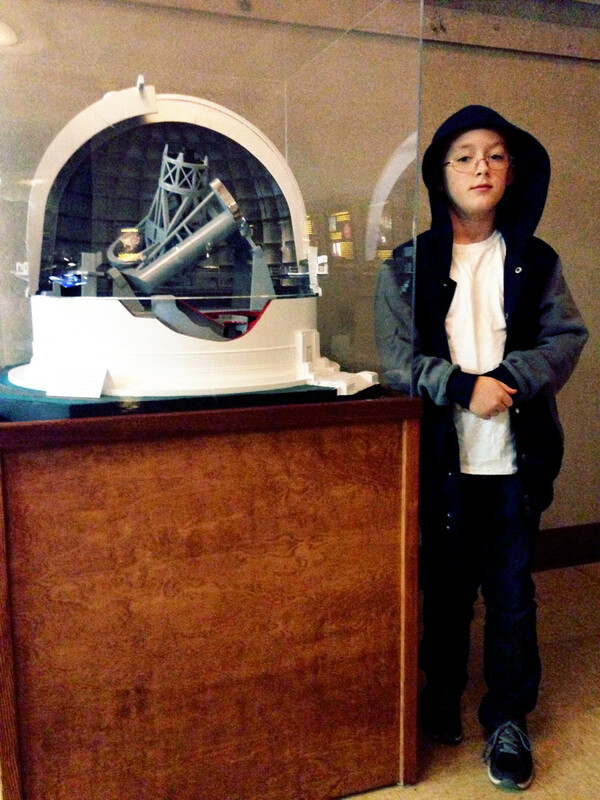 London had the whole Thanksgiving week out of school, so I took some vacation days to spend it with him. On Monay we went to Anza-Borrego Desert State Park to camp and observe – more on that in the next post. 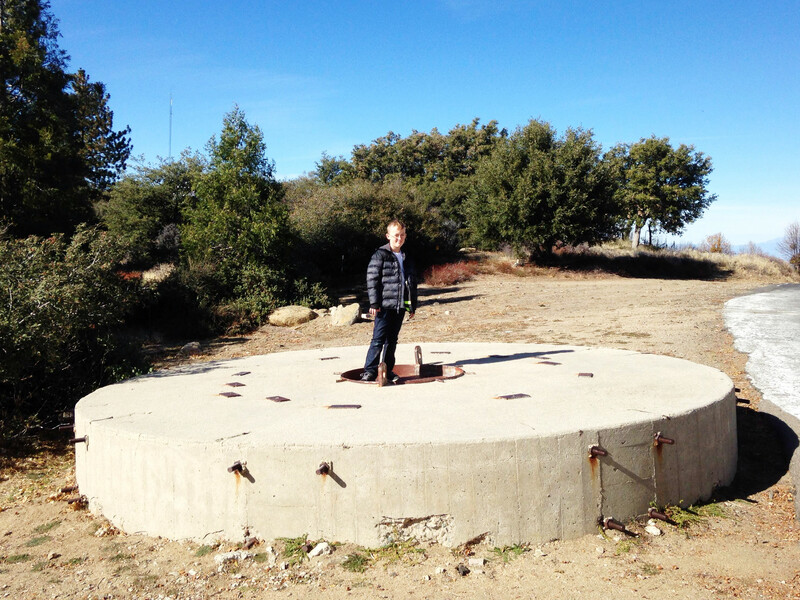 We’d never been there before, and in planning our route I noticed that we’d go pretty close to Palomar Mountain. 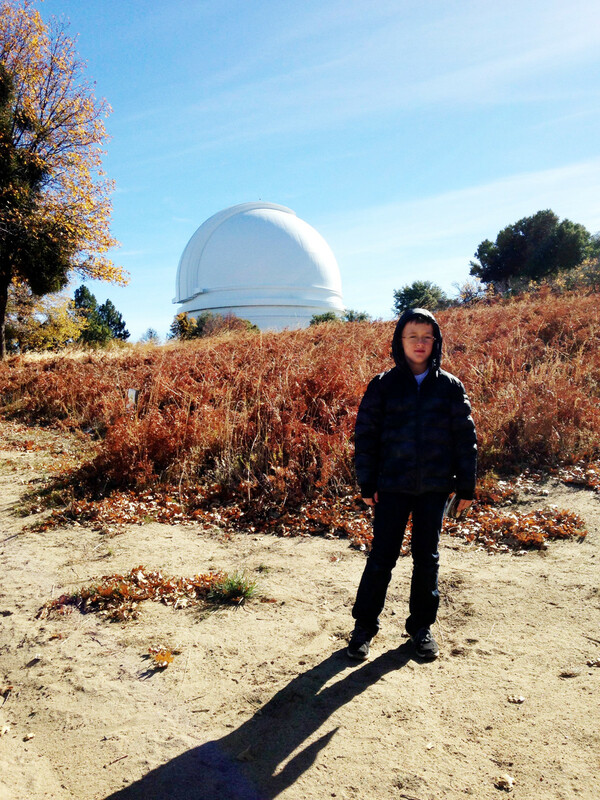 I asked London if he’d like to visit the observatory again, and he jumped at the chance. Our only previous visit, in September of 2012, had left a big impression on him. The visitor’s center had gotten a major upgrade to its exhibits in the intervening two years. 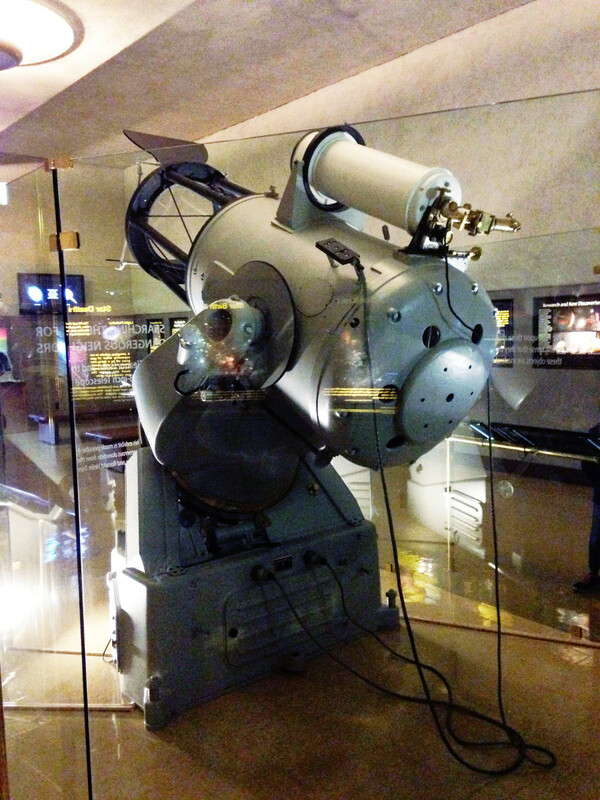 Out in the entrance lobby, a small display case showed this model and photo of the 18-inch Schmidt camera, which was the first operational telescope on Palomar Mountain. It entered service in 1936, a full 12 years before the 200-inch Hale telescope first opened its shutters in 1948. The 18-inch Schmidt had a long run – Carolyn and Eugene Shoemaker and David Levy were using it in 1993 to find and catalog near-Earth objects when they accidentally discovered Comet Shoemaker-Levy 9. The 18-inch Schmidt has since been retired, and now it’s on display in the visitor center. This is a huge upgrade to the exhibits there – when we visited in 2012, all there was to see were the lighted plates along the walls of the room. 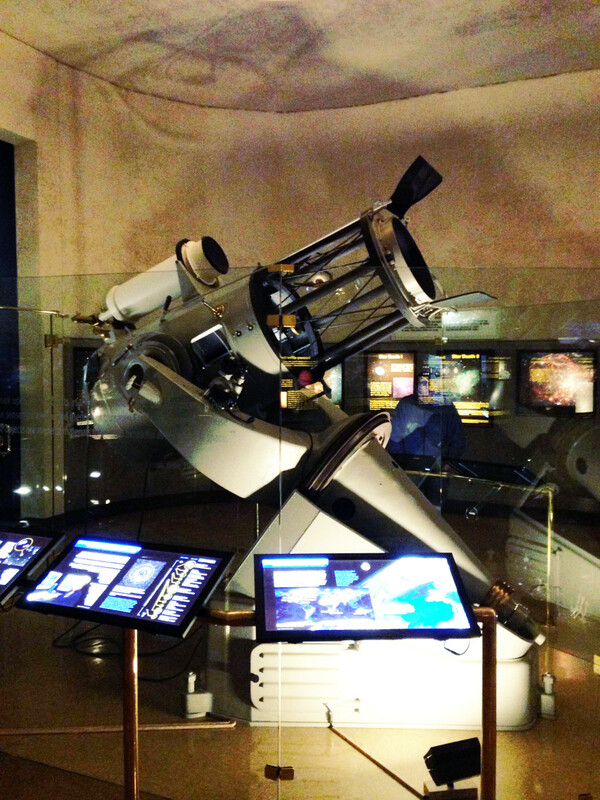 Now the 18-inch Schmidt sits in a plexiglass island that is surrounded on all sides with photographs, signage, a touch-screen that shows short movies about the history of the observatory, and display cases with equipment used to operate the camera, including the hand-operated press that punched 6-inch circles of film. Here’s the back end of the scope. As you can see, it has no eyepiece and no provision for one. Where an amateur Schmidt-Cassegrain telescope has its secondary mirror, the Schmidt camera had a piece of film (and maybe later a CCD?). On top is what looks to be a 6- or possibly 8-inch guidescope, which does have an eyepiece. Until the advent of computerized autoguiders, taking long-exposure photographs meant that an astronomer had to sit at the guidescope for hours, keeping the crosshairs centered on a guide star and tweaking the alignment of the telescope by hand. Sounds thrilling, eh? I wonder how much more productive professional astronomers are as a group, now that they don’t have to spend so many hours guiding telescopes. 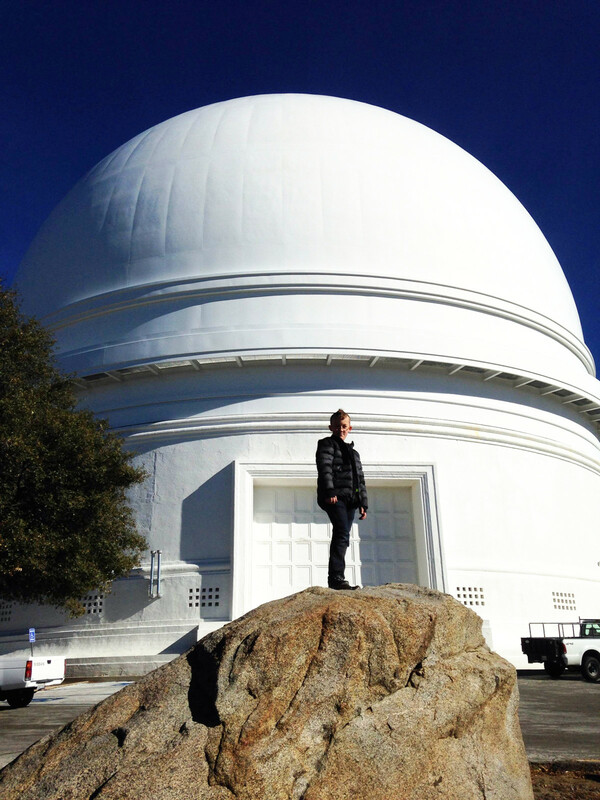 But of course the real attraction at Palomar Observatory is the 200-inch Hale telescope, which was the world’s largest fully-operational telescope for almost half a century. Astronomy books from before the early 90s talk about the Hale telescope in the same glowing tones reserved for the Hubble Space Telescope today. And for good reason – the 200-inch scope served roughly the same purpose as the HST and the twin Keck telescopes today. Until the space race of the following decades, the construction of the 200-inch telescope was probably the closest thing to a ‘megaproject’ in science and engineering. 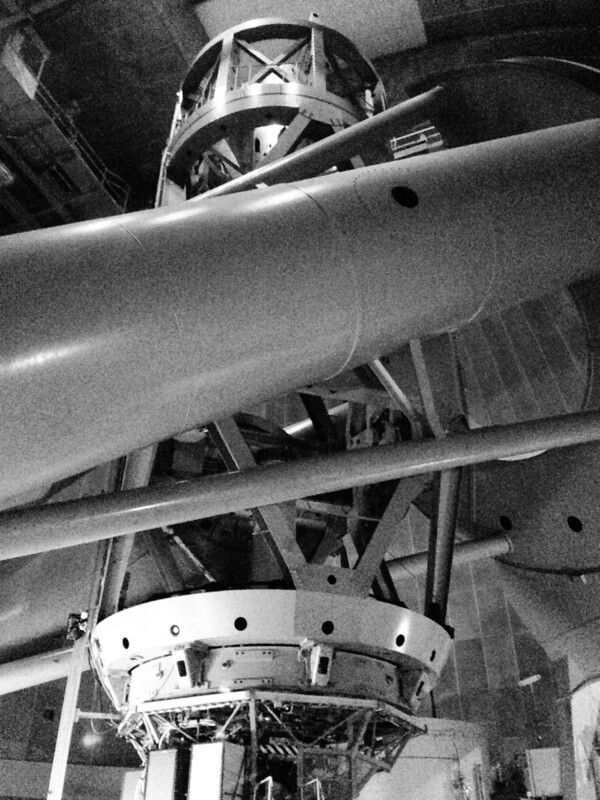 The story of how the telescope came to be is a decades-long saga of obsession, invention, science, engineering, and politics; if you’re interested in that story, I highly recommend The Perfect Machine: Building the Palomar Telescope by Ronald Florence. Here’s the 200-inch dome alongside its portrait from London’s Golden Book of Stars and Planets (1985 printing). Famously, much of the design of the 200-inch scope came from the mind of amateur astronomer and amateur telescope maker Russell Porter, who built this scale model in the 1930s. And here’s the scope itself. 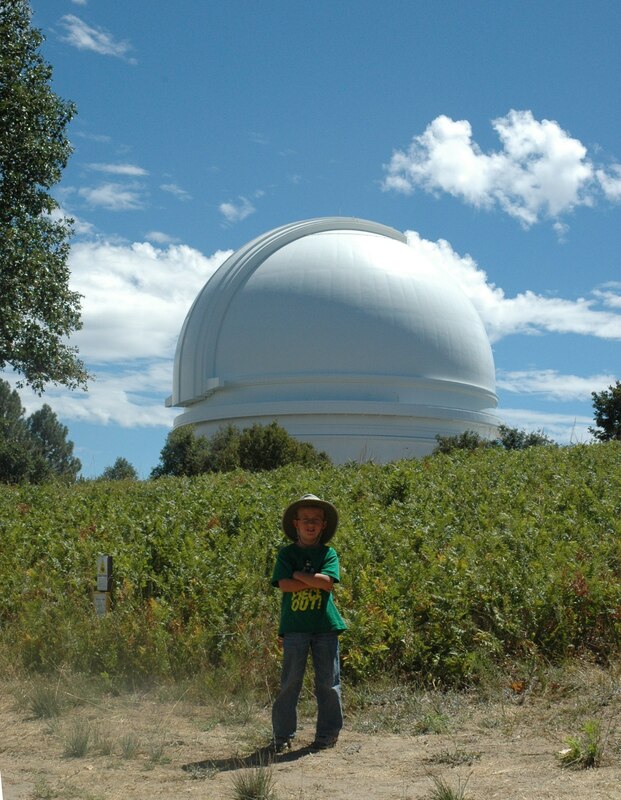 We didn’t get to go inside the dome and walk around the scope like we did last time. Those tours only run from April to October. But we were able to look in at the scope from an observation gallery. Outside the dome is this 200-inch concrete disk, which was used as a mass simulator to make sure the mechanical structure of the telescope worked before the actual mirror was installed. The mass blank has apparently been sitting out in the elements, right across the road from the dome, since 1948. It looks little worse for the wear, and it gives visitors a visceral sense of just how big a 200-inch mirror actually is. One last shot from this visit: London just off the path that leads from the visitor center to the dome. I had to take this one to replicate the picture below, from our last visit in 2012. It’s part of what is apparently now an ongoing series of pictures of London at different ages in front of the same telescope – see him with a replica of Galileo’s telescope here. Next up: crazy-dark skies at Anza-Borrego. Stay tuned. Just started getting involved with astronomy and though I am in the UK found your blog so interesting, will be back. Thanks for the kind words! Good luck battling the clouds. Hey, if the Herschels could do it, so can you.